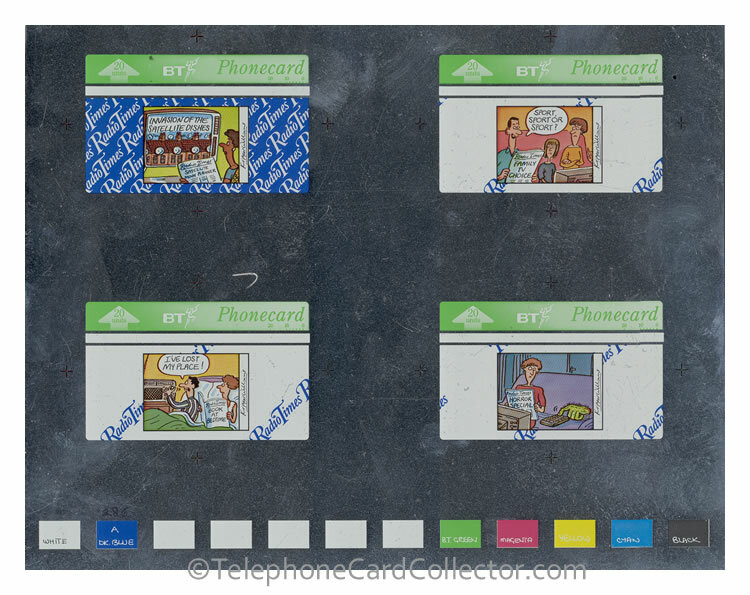 Once a BT Phonecard proof design had been approved by the individual or company commissioning the card, the next process was to test the printing process before the final telephone card was produced. Below is an example of the proof printing process for the Radio Times BT Phonecards which were released in 1994. In total the Radio Times set included four different cards each with a unique design and theme, these ranged from 'Invasion of the Satellite Dishes' to 'Sport, Sport or Sport?'. The cards were available from newsagents and Post Offices and also by collecting tokens in the Radio Times for a number of weeks. In total some 1,200,000 cards were issued, so before the telephone cards were produced the proof printing stage was essential. Pictured below is stage 3 of 12 in the printing process. At each stage an additional colour is added, the colours that have been so far added appear within the colour palette at the bottom of the proof sheet. At this stage (stage 3) only three colours have been added, these are White, BT Green and Cyan. The card design at this stage is difficult to make out. To view a larger version simply click on the image below. By stage 7 of 12 in the printing process more than half of colours of the card designs have been added and its possible to identify the Phonecards design. In addition to the colours added at stage 3 (above) - Yellow, Magenta, Black and Dark Blue have all also been added to the colour palette and the card. To view a larger version simply click on the image below. At the final and 12th stage of the proof printing process all of the different colours have been added and the final complete card as it will look is revealed. Between stage 7 and 12 a further five colours have been added, these are: Light Blue, Green, Red, a darker Yellow and Orange. The animated image below shows all 12 stages of the colour palette being applied to the Radio Times BT Phonecard - Invasion of the Satellite Dishes - catalogue number BTA079. 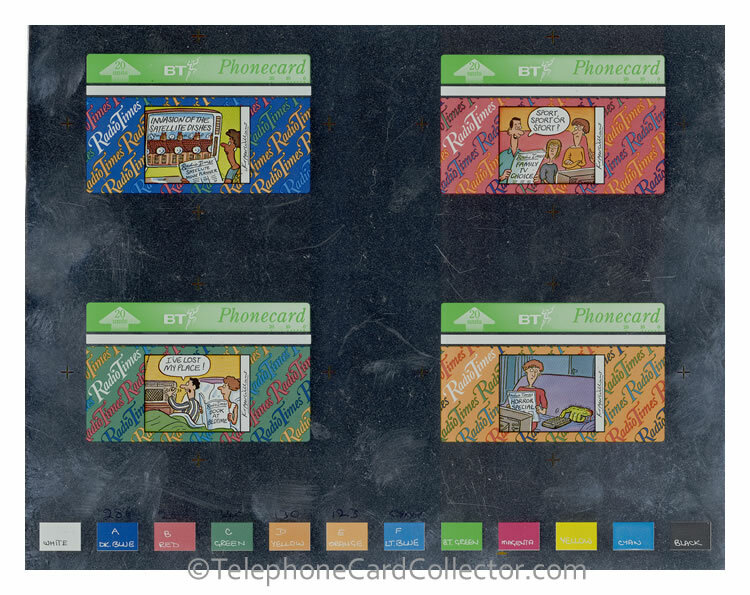 The animated image below shows the colour palette being applied to the British Red Cross (2) Emergency Response BT Phonecard - in total 7 different colours are added to the cards surface. - catalogue number BTC165. 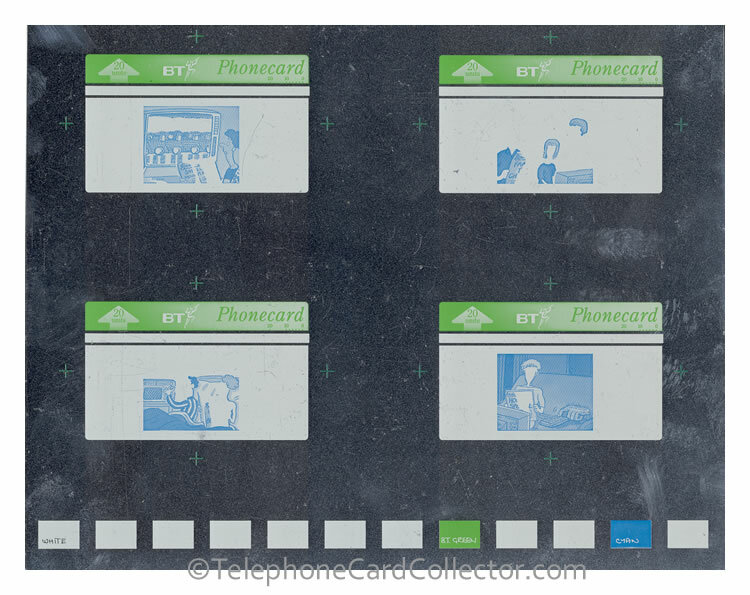 Follow Telephone Card Collector's board BT Phonecard: Printing Errors and Misprints on Pinterest.